Magic the Gathering Card Reviews and More! Hey there! Thanks for dropping by Elspeth for the Win! Take a look around and grab the RSS feed to stay updated. See you around! Divine Reckoning is an interesting card. It’s a Day of Judgment -1 of their choice with a 5WW Flashback. 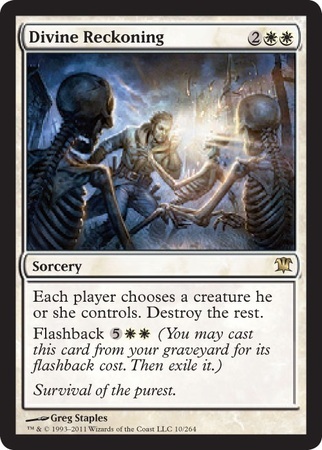 It’s a decent card, but it probably won’t see play in standard, but I think it’ll see play in Commander; white has no problem with more board wipes.